Ibanez as a brand has become synonymous with great beginner guitars. While they make a whole bunch of awesome top tier instruments, it was always their affordable stuff that attracted the largest crowds out there. The RG450DX we’re looking at today has proven to be among the best performing beginner electric guitars available on the market. While it’s placed comfortably between lower mid range and higher entry-level segment, RG450DX is one of those ‘futureproof’ choices. The body comes in form of Ibanez standard Super Strat. It’s made of pretty high-quality mahogany, and even features a Stratocaster style pick guard. Neck belongs to the Wizard III series, and is by far one of the most comfortable profiles out there. Made out of maple, this neck features a great rosewood fretboard which sports standard Ibanez Shark Tooth inlays. You can get this awesome guitar in a variety of finishes, most of which are a solid color of some kind. If you ask Ibanez, high-speed shredding is nothing if you don’t have a tremolo bridge to work with. As a matter of fact, this appears to be their main policy. The difference between this RG and one that is cheaper is in the model of the bridge itself. Here we are looking at a Std. DL tremolo bridge – a pretty decent model that doesn’t suffer from a variety of issues like its more basic alternatives ado. Tuning machines are standard Ibanez stuff, meaning that you don’t have to worry too much. Ibanez went ahead and installed three of their Quantum pickups in HSS configuration. Interestingly enough, the neck and bridge pickups are ceramic in nature while the middle one is a genuine alnico design. Pickups are wired to a single volume control knob, one tone control knob, and a standard pickup select switch. Ibanez might not have created the ultimate electric guitar, but they sure did make a very reliable and consistent one. The whole idea behind the HSS pickup configuration is to give you the best of both worlds. You want the robust bridge humbucker tone, but also the more refined single coil experience which no other pickup can really offer. Question is, did Ibanez manage to deliver this type of performance? It’s safe to say that it has, since more and more intermediate players are turning to model exactly like this one. Aside from having a pretty wholesome tone, that center alnico pickup really makes a difference. It’s there to extend the versatility of the Ibanez RG450DZ, but also to spice up the tone color to a point. At the end of the day, it all comes down to your budget. If you are searching for a great beginner model which will keep up with you as you develop your skills, then RG450DX might just be the type of solution you were looking for all along. 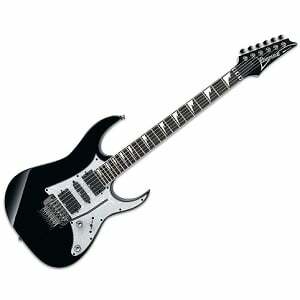 For more info about the Ibanez RG450DX, click here.